New Owners and a Fun New Look in Joliet, Montana! 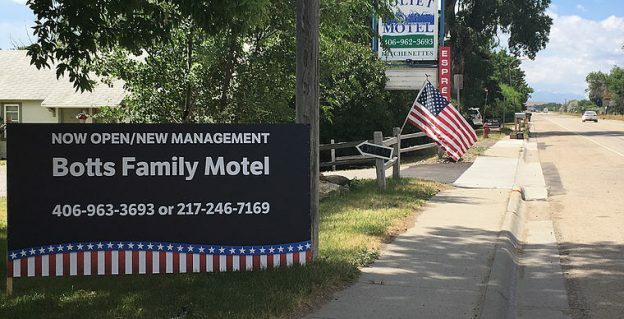 The new owners of the Botts Family Motel know there’s nothing like a new look! And the Botts family in Joliet, Montana are excited to present the Botts Family Motel (formerly the Joliet Motel), and welcome new travelers to their quaint little hamlet in south central Montana. Like they say, “Fresh paint is always good.” Travelers love updated lodging facilities- fresh linens, fresh towels, nice new snackie-type things, the aroma of freshly brewed coffee. While it’s always nice to find places that are adequate, the delight is in finding the sparkling bauble, and a sweet little room with all the pleasantries of owners excited to show off their new motel is always a fun find! Located 40 miles south of Billings, Montana, and 30 miles north of the Beartooth Pass on the way to Yellowstone Park, the Botts Family Motel looks like it’s a nice little place to spend the night.